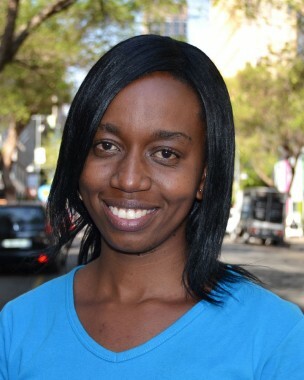 Mpho joined Sonke as an intern in 2010, under the Red Card Campaign, through an International Human Rights Exchange certificate programme with the University of Witwatersrand’s in Johannesburg. Mpho undertook the exchange programme after completing her Honours Degree in Journalism and Media Studies from the National University of Science and Technology in Bulawayo, Zimbabwe. Her love for working in the human rights sector led her to be part of a team of peer educators at Sonke in May 2011 under the Refugee Health and Rights project. Working in this project saw her rise to become a junior trainer, conducting community interventions in Johannesburg that address access to health care for refugees and migrants living in South Africa as well as educating them on their basic human rights. This project also saw her conducting workshops that promote re-integration of refugees and migrants together with the local South African nationals. In 2013 Mpho moved from the Refugee Health and Rights project to focus on working with religious leaders and faith based organisations on issues around sexual gender based violence. Since the church reaches out to a large number of people, this project also brings aspects of faith based interventions of tackling day to day social issues that are being faced within communities. Mpho was part of a team, in partnership with an organisation called Tearfund that conducted surveys and Focus Group Discussions around issues around masculinities and sexual violence among participants drawn from Christian and non-Christians in Goma, Bunia and Bukavu located in the Democratic Republic of Congo in February 2014. Mpho dreams of seeing a better Africa where human rights are respected and enjoyed by everyone, regardless of ethnicity, colour or nationality.